Posted in Healthy Home & Garden on February 18, 2013. Last modified on January 31, 2018. Read disclaimer. Made from little more than yard and kitchen wastes that decompose over a matter of weeks or months, compost is rich soil that can make almost any vegetable garden, flower bed or lawn grow stronger, faster and less susceptible to disease and insects. And, not only does composting help enrich and fertilize our heavy, North Carolina clay soil, it reduces the amount of materials that would otherwise end up in landfills. To get the proper mixture of materials for fast decomposition, make a pile that is 3-4 feet high, wide, and long. 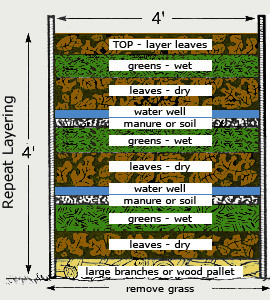 To start your compost heap, remember this order: brown (carbon), green (nitrogen), soil (bacteria and worms), and water (see the diagram at top). Do not add meat, bones, dairy products, whole eggs, or fatty foods as these materials break down very slowly and will attract animals and maggots. Do not add kitty litter or pet feces as they may transmit disease. small branches lawn clippings, juicing or vegetable scraps, manure, weeds Soil introduces micronutrients to stimulate aerobic decomposition. Remember that the smaller the particles in the compost heap, the faster the fungi, microorganisms, bacteria, worms, centipedes, and beetles can break down the waste into soil. Chopping or shredding the wastes you put into the compost heap will reduce the time you have to wait to get good, rich compost. Water and air are important to the composting process. Water each layer of the heap until it is the consistency of a wrung-out sponge. Within three or four days, the center of the pile should become hot to the touch. The heat (up to 160"F) results from the microorganisms decomposing the materials in the pile. Turn the pile when it begins to cool down. Stir it or rotate it to another bin (see turning units). Turn it every four days to provide air and even heating. Outside edges of a large compost pile do not get as hot as the center. Remember, composting is accelerated when the pile is full and turned frequently, If smaller amounts of material are used or the pile is turned less frequently, the composting process is delayed. A sunny location is preferable to shade because the sun's heat hastens decomposition. Many people start their heap in an out-of-the-way spot or build a simple holding unit from wooden pallets or wire fencing and wooden stakes. Although composting can be extremely slow, it is preferable to sending leaves and grass to the landfill where they needlessly take up space. If you want to experiment with various composting containers, consider the following options. HOLDING UNITS. This way of composting is slower, since you keep adding small quantities of materials into the pile as you accumulate them. Chop or shred wastes when possible to speed decomposition; add 1 inch of soil between layers, keep the pile moist, and turn it often to provide aeration. TURNING UNITS. Turning units speed the composting process. Gardeners with high volumes of organic matter will find that this process yields large quantities of compost in less time. Build the heap as outlined in Figure 1. When the heat decreases at the center of the first pile, turn it into the next bin. Dampen the materials to the wrung out sponge stage: add more "green" matter to the pile if heating does not occur. When heat decreases again, turn bin two into bin three. Build a new pile in the first bin. Repeat the process each time the pile in the first bin cools. After two weeks in the third bin, the compost should be ready for garden use. TUMBLERS. Tumblers are barrels or containers on a frame that can be rotated by hand. This is an effortless way to mix materials. Disadvantages are the expense of the equipment and the amount of compost produced, which is limited by the size of the tumbler. The compost has a bad odor. Not enough air. Turn it. The compost is damp and warm in the middle but nowhere else. Pile too small. Collect more material and mix with the old ingredients into a new pile. The heap is damp and sweet smelling but still will not heat up. Lack of nitrogen. Mix in a nitrogen source like fresh manure, bloodmeal, or grass clippings.